Mame Biram Diouf marked his first start for Blackburn with a hat-trick as the Premier League side eased past Norwich to reach the Carling Cup third round. The Senegal international, on a season-long loan from Manchester United, headed in after Chris Samba flicked on Morten Gamst Pedersen's long throw. Blackburn keeper Mark Bunn saved well from Simeon Jackson and Grant Holt before Diouf, 22, tapped in his second. Diouf nodded in a third before Jens Berthel Askou headed a consolation. Rovers boss Sam Allardyce introduced Diouf from the bench during his side's first two league matches but picked the visit of Norwich to give the striker a first start - and he did not disappoint. Diouf, who made six appearances for United last season and also sat on the bench for their Carling Cup final win over Aston Villa, was heavily involved throughout. He opened the scoring at Ewood Park with a typical poacher's goal, stooping to convert Samba's flick after Pedersen's arcing throw into the box. Just before half-time Jackson saw his low shot tipped around the post post by Bunn and shortly after the break Holt had shot fumbled by the keeper. Blackburn were dominating possession but Norwich remained a threat, Holt flashing a near-post header across goal from David Fox's corner and Bunn producing a reaction save to keep the ball out. Amine Linganzi almost extended the home side's lead when he volleyed against the post and seconds later Diouf planted a close-range header against the crossbar from Pedersen's left-wing free-kick. But when Pedersen's shot from Junior Hoilett's cross was spooned up in the air by keeper Declan Rudd, Diouf stabbed home despite the best efforts of the Norwich defence to prevent it crossing the line. And Diouf capped a fine individual performance with a five-yard header from another Pedersen cross late on. Berthal Askou's 90th-minute header from a corner was was in vain for the visitors. 93:25 The ref blows the whistle to start the match. 90:00+2:31 The ball is delivered by Simon Lappin, clearance by Pascal Chimbonda. 90:00+1:25 Attacking throw-in by George Francomb (Norwich). 89:50 The assist for the goal came from David Fox. 89:50 GOAL - Jens Berthel Askou:Blackburn 3 - 1 Norwich Jens Berthel Askou finds the back of the net with a headed goal from close range. Blackburn 3-1 Norwich. 88:57 Centre by Anthony McNamee, Stephen Hughes takes a shot. Save by Mark Bunn. 88:08 The ball is swung over by Anthony McNamee, Phil Jones manages to make a clearance. 87:40 The ball is delivered by George Francomb, David Hoilett manages to make a clearance. 87:32 The ball is sent over by Simon Lappin, blocked by Steven Nzonzi. 86:54 The ball is sent over by Anthony McNamee. 86:07 Simon Lappin delivers the ball, save by Mark Bunn. 85:49 Defending throw-in by Martin Olsson (Blackburn). 84:46 Centre by Simon Lappin, Pascal Chimbonda manages to make a clearance. 83:15 Assist on the goal came from Morten Gamst Pedersen. 83:15 GOAL - Mame Diouf:Blackburn 3 - 0 Norwich Mame Diouf scores a headed goal from close in. Blackburn 3-0 Norwich. 82:47 Goal kick taken long by Mark Bunn (Blackburn). 82:37 Effort from the edge of the area by Stephen Hughes goes wide of the left-hand post. 81:28 Centre by Anthony McNamee, Phil Jones makes a clearance. 80:43 David Hoilett concedes a free kick for a foul on Jens Berthel Askou. Jens Berthel Askou takes the direct free kick. 80:20 Substitution Gael Givet goes off and Martin Olsson comes on. 79:15 Morten Gamst Pedersen provided the assist for the goal. 79:15 GOAL - Mame Diouf:Blackburn 2 - 0 Norwich Mame Diouf finds the back of the net with a goal from close range low into the middle of the goal. Blackburn 2-0 Norwich. 78:54 The ball is swung over by David Hoilett, Morten Gamst Pedersen takes a shot. Save by Declan Rudd. 77:29 Goal kick taken long by Declan Rudd (Norwich). 76:43 Morten Gamst Pedersen takes the outswinging corner, Header from close in by Gael Givet misses to the left of the target. 75:59 Corner from the left by-line taken by Morten Gamst Pedersen, Gael Givet takes a shot. Clearance by George Francomb. 75:53 David Hoilett crosses the ball, Matthew Gill gets a block in. 75:06 Morten Gamst Pedersen takes a shot. Blocked by Jens Berthel Askou. 74:20 Foul by George Francomb on David Hoilett, free kick awarded. A cross is delivered by Morten Gamst Pedersen, Mame Diouf takes a shot. 74:04 Brett Emerton sends in a cross, save made by Declan Rudd. 73:25 Shot by Amine Linganzi from inside the penalty box hits the post. 73:12 Centre by Morten Gamst Pedersen, Elliott Ward makes a clearance. 72:49 The ball is swung over by Morten Gamst Pedersen, clearance by Elliott Ward. 72:38 The ball is swung over by Steven Nzonzi, George Francomb manages to make a clearance. 72:01 Anthony McNamee concedes a free kick for a foul on Pascal Chimbonda. Morten Gamst Pedersen takes the free kick. 71:11 Substitution Stephen Hughes comes on in place of Russell Martin. 71:00 Goal kick taken long by Mark Bunn (Blackburn). 70:54 Elliott Ward produces a cross. 68:08 Attacking throw-in by Morten Gamst Pedersen (Blackburn). 66:51 Substitution Anthony McNamee replaces Wesley Hoolahan. 66:51 Substitution Oli Johnson on for Grant Holt. 66:16 Inswinging corner taken by Simon Lappin, Steven Nzonzi makes a clearance. 65:57 Inswinging corner taken right-footed by David Fox from the left by-line, clearance made by Gael Givet. 65:42 The ball is sent over by George Francomb, Phil Jones makes a clearance. 64:33 Attacking throw-in by Lars Jacobsen (Blackburn). 64:05 Simon Lappin sends in a cross, clearance made by Gael Givet. 63:40 A cross is delivered by Pascal Chimbonda, Elliott Ward makes a clearance. 60:40 Substitution (Blackburn) makes a substitution, with Phil Jones coming on for Christopher Samba. 60:40 Substitution Steven Nzonzi is brought on as a substitute for Vincenzo Grella. 60:17 Corner taken by Morten Gamst Pedersen from the right by-line, Christopher Samba has a headed effort at goal from close in which goes wide right of the target. 60:04 The ball is sent over by Lars Jacobsen, blocked by Russell Martin. 58:46 Defending throw-in by George Francomb (Norwich). 58:39 A cross is delivered by Pascal Chimbonda, Matthew Gill makes a clearance. 57:11 The ball is swung over by Morten Gamst Pedersen, George Francomb gets a block in. 54:51 Lars Jacobsen delivers the ball, Jens Berthel Askou manages to make a clearance. 53:51 The assistant referee signals for offside against Mame Diouf. Declan Rudd takes the direct free kick. 53:36 The ball is sent over by Wesley Hoolahan, save by Mark Bunn. 51:30 Goal kick taken long by Declan Rudd (Norwich). 51:13 Mame Diouf has a headed effort at goal from close range which goes wide left of the target. 50:53 Grant Holt takes a shot. Mark Bunn makes a save. 50:33 Vincenzo Grella challenges Wesley Hoolahan unfairly and gives away a free kick. Free kick taken by David Fox. 49:26 The ball is crossed by Brett Emerton, clearance made by Jens Berthel Askou. 48:06 Defending throw-in by George Francomb (Norwich). 47:57 Defending throw-in by George Francomb (Norwich). 47:17 Defending throw-in by Russell Martin (Norwich). 45:37 Defending throw-in by Lars Jacobsen (Blackburn). 44:30 Inswinging corner taken by David Fox, clearance by Pascal Chimbonda. 44:14 Simeon Jackson takes a shot. Save by Mark Bunn. 44:06 Matthew Gill crosses the ball, clearance made by Christopher Samba. 43:37 The assistant referee flags for offside against Mame Diouf. Jens Berthel Askou takes the free kick. 43:24 The ball is sent over by Matthew Gill, Mark Bunn makes a save. 43:11 Centre by Pascal Chimbonda, Elliott Ward makes a clearance. 41:45 Goal kick taken long by Mark Bunn (Blackburn). 40:44 Goal kick taken long by Mark Bunn (Blackburn). 40:24 Wesley Hoolahan sends in a cross, Effort from inside the area by David Fox misses to the left of the goal. 40:05 Attacking throw-in by George Francomb (Norwich). 39:28 Corner from the left by-line taken by David Fox, clearance made by Gael Givet. 36:53 Grant Holt challenges Christopher Samba unfairly and gives away a free kick. Mark Bunn restarts play with the free kick. 36:24 The assistant referee flags for offside against Mame Diouf. Direct free kick taken by Declan Rudd. 33:57 Goal kick taken long by Declan Rudd (Norwich). 33:27 Goal kick taken long by Mark Bunn (Blackburn). 32:58 Defending throw-in by Pascal Chimbonda (Blackburn). 32:10 Attacking throw-in by David Hoilett (Blackburn). 31:12 The ball is delivered by Pascal Chimbonda, clearance made by David Fox. 30:48 Christopher Samba takes a shot. David Fox gets a block in. 30:14 Attacking throw-in by Morten Gamst Pedersen (Blackburn). 29:51 Defending throw-in by Lars Jacobsen (Blackburn). 29:30 The ball is crossed by Simon Lappin, Gael Givet manages to make a clearance. 28:34 The assist for the goal came from Christopher Samba. 28:34 GOAL - Mame Diouf:Blackburn 1 - 0 Norwich Mame Diouf grabs a headed goal from close range. 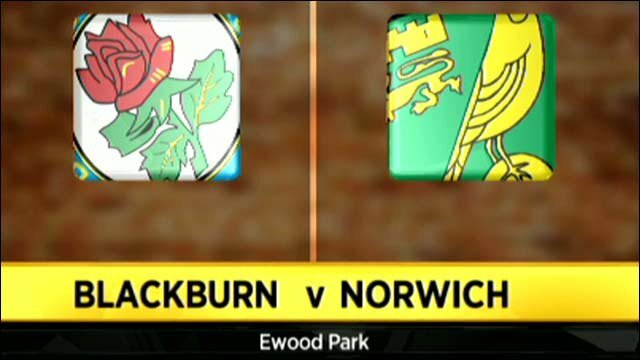 Blackburn 1-0 Norwich. 27:46 The ball is swung over by Lars Jacobsen, clearance by Jens Berthel Askou. 27:02 David Fox challenges Amine Linganzi unfairly and gives away a free kick. Free kick taken by Vincenzo Grella. 25:10 Unfair challenge on Simon Lappin by David Hoilett results in a free kick. Direct free kick taken by Russell Martin. 24:48 The ball is sent over by Morten Gamst Pedersen. 24:14 David Hoilett delivers the ball, blocked by David Fox. 24:07 Morten Gamst Pedersen sends in a cross, George Francomb makes a clearance. 23:39 Goal kick taken long by Declan Rudd (Norwich). 22:34 Free kick awarded for a foul by David Fox on Morten Gamst Pedersen. Brett Emerton produces a shot on goal direct from the free kick. 22:09 Goal kick taken long by Mark Bunn (Blackburn). 21:53 Goal kick taken long by Mark Bunn (Blackburn). 21:11 Attacking throw-in by Simon Lappin (Norwich). 20:42 The ball is crossed by Simon Lappin, Pascal Chimbonda manages to make a clearance. 20:24 Attacking throw-in by George Francomb (Norwich). 19:59 Christopher Samba gives away a free kick for an unfair challenge on Grant Holt. Grant Holt restarts play with the free kick. 18:54 Amine Linganzi gives away a free kick for an unfair challenge on Wesley Hoolahan. The ball is sent over by Simon Lappin, Grant Holt takes a shot. Save by Mark Bunn. 18:24 Free kick awarded for an unfair challenge on Jens Berthel Askou by Christopher Samba. Free kick taken by Declan Rudd. 18:01 A cross is delivered by David Hoilett, George Francomb manages to make a clearance. 17:36 The ball is swung over by Brett Emerton, Morten Gamst Pedersen takes a shot. Declan Rudd makes a save. 17:02 David Fox takes a shot. 16:52 Wesley Hoolahan produces a cross, clearance by Christopher Samba. 16:12 Morten Gamst Pedersen takes the outswinging corner, clearance by Simon Lappin. 15:55 Amine Linganzi takes the chance to get an effort at goal. Matthew Gill gets a block in. 15:22 Defending throw-in by George Francomb (Norwich). 15:13 David Hoilett produces a cross. 14:58 Attacking throw-in by Pascal Chimbonda (Blackburn). 14:46 The ball is sent over by Amine Linganzi, clearance by Jens Berthel Askou. 13:50 The ball is delivered by Brett Emerton. 12:52 Goal kick taken long by Mark Bunn (Blackburn). 11:46 The ball is swung over by Morten Gamst Pedersen, save by Declan Rudd. 11:28 Defending throw-in by Lars Jacobsen (Blackburn). 10:43 Brett Emerton has an effort at goal from just outside the box which goes wide of the right-hand post. 10:32 Attacking throw-in by George Francomb (Norwich). 10:12 Gael Givet takes a shot. Save by Declan Rudd. 9:41 Inswinging corner taken right-footed by Morten Gamst Pedersen, clearance made by Jens Berthel Askou. 9:09 Morten Gamst Pedersen takes the inswinging corner, save by Declan Rudd. 8:57 Amine Linganzi takes a shot. Russell Martin gets a block in. 7:58 Attacking throw-in by Morten Gamst Pedersen (Blackburn). 6:43 Goal kick taken long by Declan Rudd (Norwich). 5:58 Outswinging corner taken left-footed by Morten Gamst Pedersen, Gael Givet has a headed effort at goal from close range which goes wide of the left-hand post. 5:52 Centre by Morten Gamst Pedersen, blocked by Jens Berthel Askou. 5:33 Attacking throw-in by Pascal Chimbonda (Blackburn). 5:06 Defending throw-in by Lars Jacobsen (Blackburn). 4:47 George Francomb delivers the ball. 4:35 Lars Jacobsen takes a shot. Russell Martin gets a block in. 3:59 Attacking throw-in by Morten Gamst Pedersen (Blackburn). 3:49 Brett Emerton takes a shot. Blocked by Russell Martin. 2:48 Goal kick taken long by Declan Rudd (Norwich). 1:54 Vincenzo Grella produces a cross, Declan Rudd makes a save. 1:32 Grant Holt is flagged offside by the assistant referee. Mark Bunn takes the direct free kick. 0:33 Gael Givet challenges Simeon Jackson unfairly and gives away a free kick. Russell Martin restarts play with the free kick.